Apple has just taken the wraps off the brand new and improved iPad Air, but how does it compare to the iPad 4? Packed with new features and specs it boasts a thinner, lighter design, beefier processor, all for the same price. Little more than month after they held a special event to announce the iPhone 5s and iPhone 5c, Apple's back with the new iPad Air. 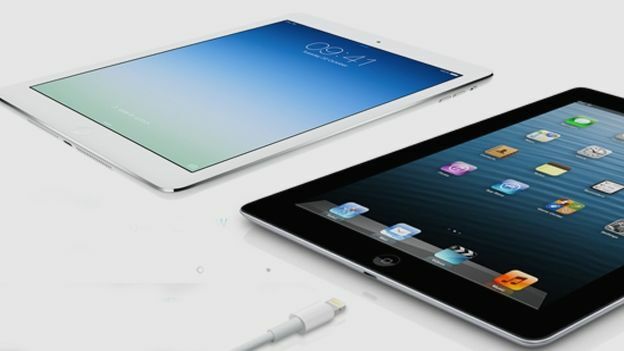 Amongst them is the latest incarnation of the iPad, but should this be your next tablet? Read on to see how it compares to the model from last year, or check out our hands on iPad Air review to get our early thoughts. For the last three iterations, Apple has stuck with the same basic design for its daddy of the iPad family, however this year we're all in for a bit of a change. Taking design cues from the iPad Mini, the 9.7-inch version retains the same display size, but features severely shrunken down bezels, giving a much more compact feel. The iPad Air has 43% thinner bezels than the previous model and measures just 7.5mm thick. Weight has also been slashed, and the iPad Air tips the scales at an impressive 1lb (453g), down from 1.4lbs (635g). The 20% reduction in weight makes this one of the lightest 10-inch tablets in the world. Since Apple announced the Retina Display toting iPad 3, or the New iPad, last year, we've constantly been impressed the visual depth and clarity of the screen. The 2,048 x 1,536 resolution display is sticking around for another year, not that we have any qualms with as it is already one of the best displays on the market. Apple says that it's spent years working on the design of the iPad Air, and we criticised the iPad 3 and iPad 4 for being too bulky when Retina was added. The thin and lightweight build makes the wonderful visuals provided by Retina all the more appealing. Underneath that thinner and lighter body you'll find the new A7 processor, featuring the same 64 bit architecture as the recently released iPhone 5s. Apple says the new iPad Air is now 8x faster and has 72x the graphics performance of the original iPad. So how does that stack up against the iPad 4? Well, the iPad Air has managed to double the power of its predecessor, which is no mean feat. However, that x64 architecture really shows in the gaming department. The model from last year came with a Dual-core A6X chip with quad-core graphics and it ran smoothly, so we can only assume this year's version will be even more of an improvement. The M7 coprocessor is included as well, for all your motion needs. Apple was also keen to point out that the iPad Air boasts MIMO wireless tech, which should boost wireless speeds over the iPad 4, which is good news for tablet surfers. Providing the juice for the iPad 4 was a 42.5-watt-hour battery, which could easily get us through a day of emailing, surfing, movie watching and app playing with plenty left over for the next day. Apple claim the new iPad Air should still last for 10 hours, even though the battery has been shrunk down to fit the new shell. After over a decade of kitting all new releases with a 30-pin connector, Apple switched to the new and improved Lightning port last year. This is probably what prompted the quick turnaround from the iPad 3 to the iPad 4, as Apple wanted all new products to have the new port. Aside from the Lightning port, the new iPad Air features, Bluetooth 4.0, GPS and, as ever, there's an option for LTE 4G data, though you'll have to pay a premium. What sets the new iPad Air apart from previous models is the addition of MIMO for 2x faster 802.11n. Probably the area we're least excited about with the new iPad Air is the optics, while you can take perfectly serviceable snaps with your slate, it's just not something we'd advise doing. Last year's model was equipped with a 5mp iSight camera, complete with autofocus, backside illumination and the ability to shoot 1080p video. While video calling was taken care of thanks to a 1.2mp Facetime shooter. The iPad Air retains that 5mp camera, though it adds in an improved FaceTime HD camera with larger pixels, along with dual microphones. Coming complete with a thinner, lighter design, along with a whole heap of internal improvements, the iPad Air is sure to mark a new spell of dominance for Apple's all conquering tab. The lack of Touch ID may annoy a few, but there has to be something to make you upgrade next year. Stay tuned for a full hands on review coming up soon.